BBT-SF-4 and BBT-SF-4DB Shown Above. EWI Tourcase tm Model BBT-SF-4 and BBT-SF-4DB casters. These are solidly built, 4" soft wheeled, swivel casters suitable for all types of road trunks and cases. 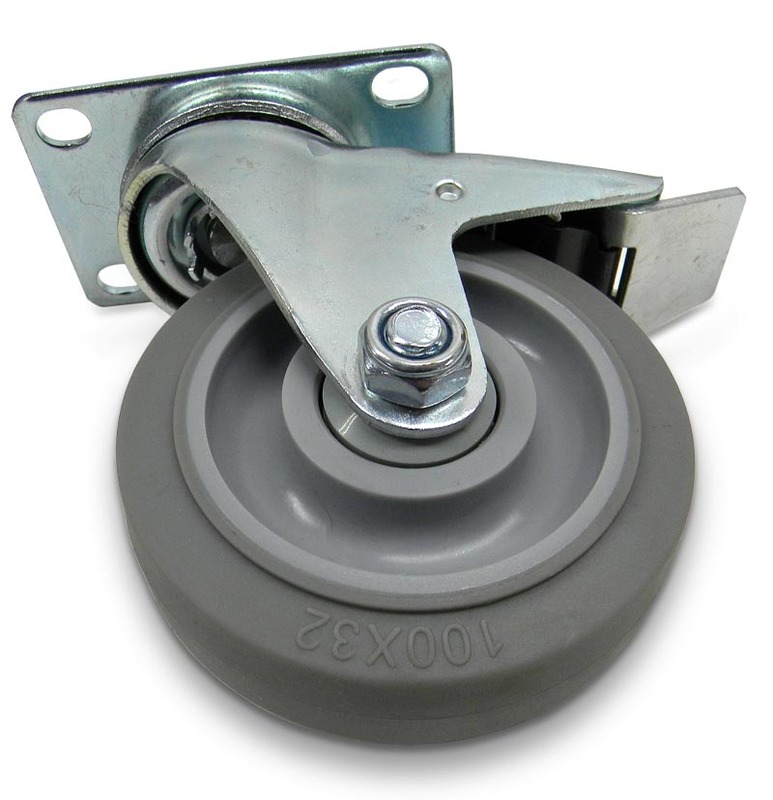 These "softer wheel" casters deliver a relatively smooth, quiet ride, which is especially noticeable on rougher surfaces such as outdoor concrete or asphalt. 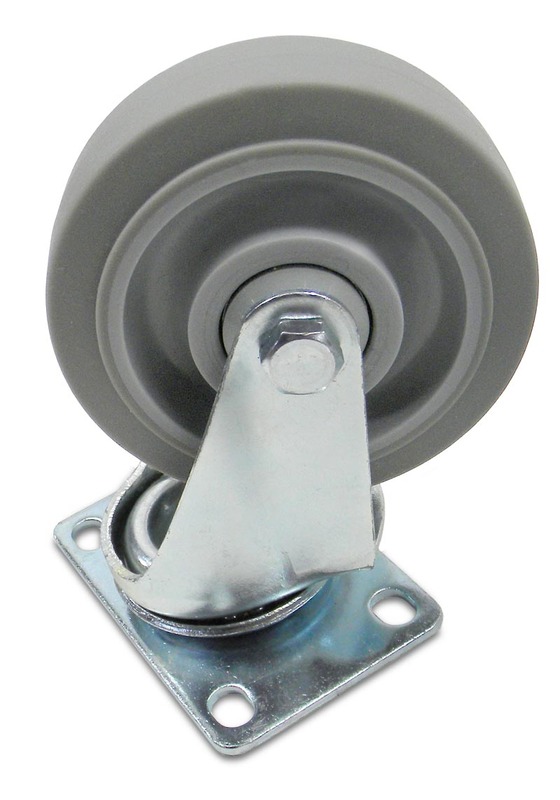 These casters are available with or without brakes. The wheels are non-marring and utilize two sealed ball bearings for a higher load capacity and longer service life. The load capacity is rated at 150 pounds per caster. 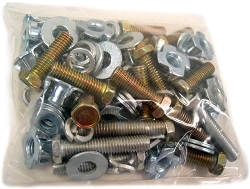 The recommended mounting bolts are 5/16" or 8mm. The brake is a friction brake and not a locking brake; therefore, the brake style casters are suitable for keeping a case from rolling on an uneven stage, but they are not intended to be a substitute for load locking a case in a truck. If the casters are to be used on any other than EWI caster boards, some modifications may be needed to fit the casters to your particular case. 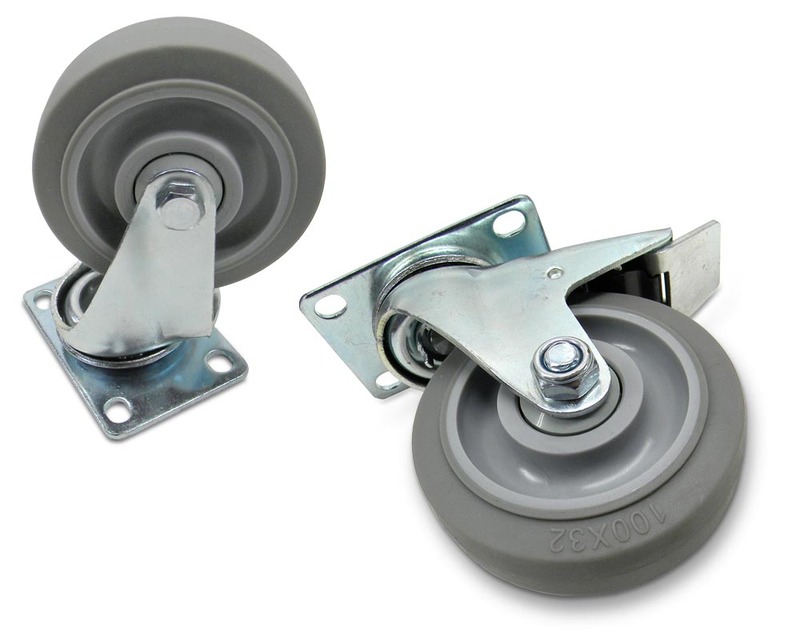 These casters are constructed with the same frames as the EWI BBT-4 and BBT-4DB casters as shown here, only the wheel is different: Click here for Blue BBT caster page. We also stock replacement wheels for these soft wheeled casters, which will interchange with the blue wheels on the BBT-4 and BBT-4DB casters. 4" Caster for equipment cases and racks. Mounting Plate: 3 3/4" x 2 3/8"
Mounting Holes Center to Center: 2 7/8" x 1 3/4"